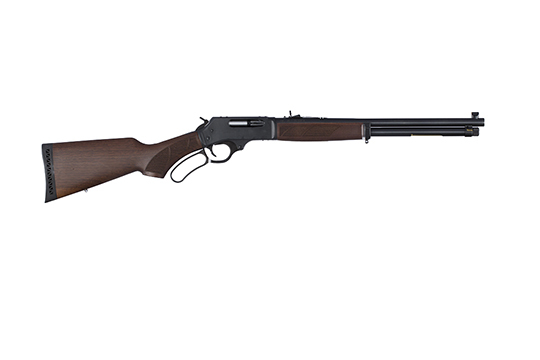 Other than determining where you will go for your hunting trip, the most important consideration for your hunting trip is choosing the right rifle, and with the Henry Repeating Arms Lever Lever Action Rifle you can be assured that your hunting trip will be a success. + Informal Recreation Shooting Backyard clays, tin cans, spinning/swinging targets, water jugs, etc. + Metallic Silhouette Metallic silhouette involves shooting at steel targets representing game animals at varying distances, seeking to knock the metal target over. + Cowboy Action Shooting A type of multi-gun match utilizing a combination of pistol(s), rifle, and/or shotgun in a variety of "old west themed" courses of fire for time and accuracy. Participants must use gear and accessories as mandated by the respective sanctioning group rules. + Upland Game Quail, pheasant, grouse, rabbits, turkey, dove, ptarmigan, etc. + Varmints Woodchucks, marmots, prairie dogs, rats, coyotes, fox, raccoons, opossums, squirrels, crows, starlings, cowbirds, etc. + Vintage Firearms Pre-1964 Winchesters, discontinued production, antiques, etc. + Informal Recreation Shooting Plinking, backyard clays, tin cans, spinning/swinging targets, water jugs, etc. + Metallic Silhouette Metallic silhouette involves shooting at steel targets representing game animals at varying distances, seeking to knock the metal target over.